After a long hiatus... WFC2017! Hello Gods and Goddesses. It's me, Rainy. I've been gone a long time from this website, as I have not been able to maintain it the way it deserves. You will find a lot of older information on here, but it's still good information. I have confirmed my registration for World Fantasy Con 2017 in San Antonio, Texas this November, and hope to participate in the programming, as usual. Hope to see you all there. For those of you interested, there is an interview with me over at the HWA website for Women In Horror Month, along with many of my beautiful and talented colleagues. Scroll down the Blog to see the rest. Lots of goodies in there! Poetry Performance with Rain Graves and ruth weiss! I am pleased to announce I will be doing a poetry performance reading tomorrow, September 3, at Isis Oasis in Geyserville. I'm opening for the amazing and incredible Beat Poet, ruth weiss, author of many, many things. Her most recent work is called THE BEAT GOES ON, and she performs with a band. I'm so honored to be a part of this low-key, non-publicized event. We'll do another together that will be shouted to the far reaches of the Earth, but for now, we'd love to see you at 8pm tomorrow. Here is a great interview with ruth on youtube, and another clip of ruth weiss live in vienna, october 21, 2013 with her band. Rooms at the Oasis are available to book by calling the Oasis at: (707) 857-4747. The address is 20889 Geyserville Ave, Geyserville, CA 95441. (707) 857-4747. See you in the Grand Theater! I am reading this Saturday, 10/18 in Berkeley at Sumiko Saulson﻿'s book release party for Happiness and Other Diseases from 2pm-5pm at The Dark Entry, 2589 Telegraph. 2. After that, I will be reading in San Francisco 10/18 at LitCrawl in the Mission with others under the Damnation Books publishing umbrella (Haunted Mansion Project Books I and II). The venue is Casa Bonampak, 1051 Valencia. We go on at 8:30pm. Description: Including poetry in fantasy, both by the author and quoted from other sources, used to be more common, such as Alice in Wonderland, The King of Elfland’s Daughter, The Lord of the Rings, and The Worm Ouroboros. Why is poetry not as prevalent now as in the past? Are certain types of poetry, such as non-formal or non-rhyming verse, under-used in fantasy? I should also be part of the Mass Autograph Signing as well and will have books. Learn how to perfect your poetry in this intensive four-week course for genre writers of all levels. Learn how to turn your short stories into poems, poems into short stories, classic form poetry, free-verse, and reading to an audience. Students will be given assignments and study points, followed by a graded critique, designed to get your work ready for sending to publishers, and to give you the confidence you need when giving readings. Classes and critiques will take place via email and Skype (where available to the student - you will not be turned away if you do not have Skype), providing one-on-one care and attention to your work, including line-edits. Whether you are writing a collection, a series for magazine submissions, or just a few poems for yourself...this course will be invaluable to your growth as a writer. Four Weeks; classes and assignments will be given every Tuesday, beginning November 4, 2014, at 6pm PST / 9pm EST. Students will receive the syllabus and required reading for each class upon sign-up. No refunds for no-shows. If you must skip a class, make-ups will be given on a case-by-case basis. Payments can be made via paypal at spiderwords@gmail.com, or via Square in person. 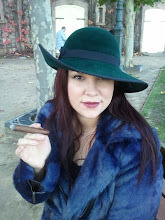 About the Instructor: Rain Graves is a two-time Bram Stoker Award Winning Poet (2002, 2013), whom Publisher's Weekly hailed as "Bukowski meets Lovecraft," for her work in BARFODDER: Poetry Written in Dark Bars and Questionable Cafes in 2009. She lives and writes in San Francisco. 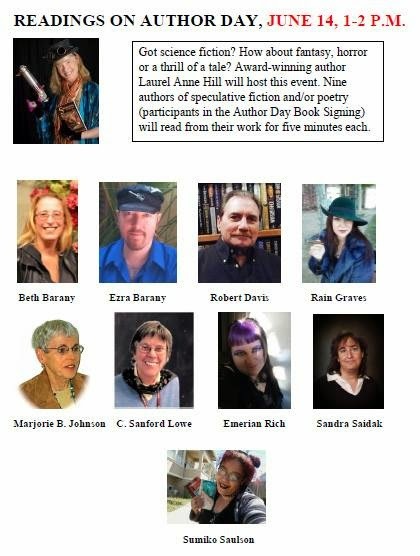 Join me with nine other horror, sci-fi, and fantasy authors as we read and sign books at the San Mateo County Fair's Author Day on June 14, 2014 from 1pm to 4pm, with the signings occurring from 2-4pm. Here is a link to the location details, etc., on SFGate. The Four Elements by Linda Addison, Rain Graves, Charlee Jacob, and Marge Simon has won the 2013 Bram Stoker Award for Superior Achievement in Poetry. We were presented with the award at the Stokers Banquet this past weekend in Portland Oregon, and were surprised, delighted, and honored to have won. Linda and I were present, and thanked our publisher, Bad Moon Books for believing in the project, Donald Sidney-Fryer for his wonderful essay and blurb on the book, and of course, each other...for being such great partners in crime. Thank you to the HWA, and everyone who voted for TFE. Your support of our work means the world to us. Here is a link to all the winners, in all categories. All of your favorite writers are in one spot and are willing to sign books! A few horror authors have such a unique voice that whatever the book is, their fans never want that author's world or universe to end past the last page. How does any writer find their voice? HWA and our sponsor Samhain Horror would like to invite all convention attendees to join us for the traditional party after the presentation of the Bram Stoker Awards. Come and celebrate!